Man, I love it when the universe sends me signs in the form of clothes designed by my heroes. Vincent van de Waal, also known as one of my favourite artists in the entire universe, also known to our dear friends who have got his art hanging up on their walls because Mr. van de Waal graciously designed our wedding invitation last year and of course first and foremost known as PATTA 's creative director designed the graphics on the lining of this gorgeous Patta Fear Nothing Harrington Jacket. It comes in three colour ways and has such nice detailing. I love the round collar and the tonal logo embroidery. But the best part is the lining. One of Hotblox' signature guys cutting up the most hated but also most common of emotions on the inside of your jacket, close to your heart and gut might just be what you need as a reminder that the next level is yours to take. Just go get 'em son. 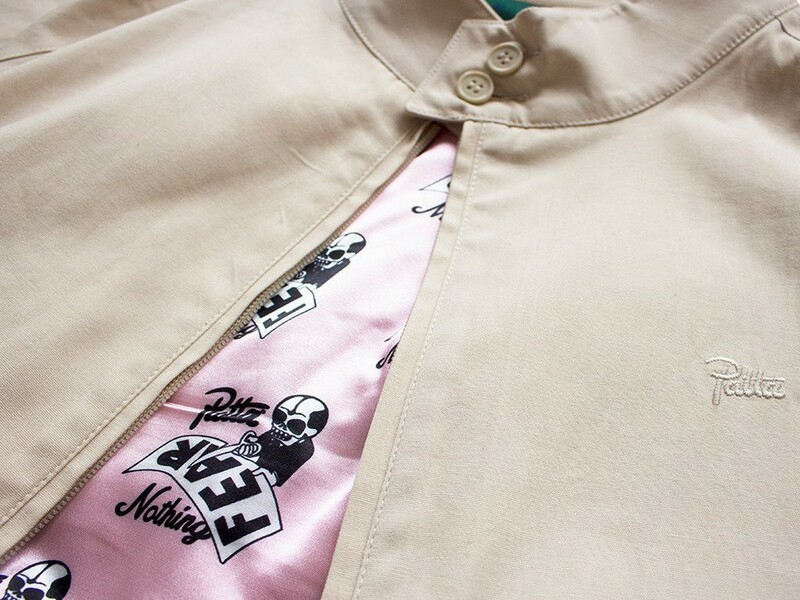 The Patta Fear Nothing Harrington Jacket will be available in store at Patta Amsterdam, Friday, June 3rd Online date to be announced. Retail price: €160,00.